A Limited Edition flavour! We made especially for lovers of the classic winter warmer, this white chocolate bar is delicately flavoured with pumpkin, lightly spiced and swirled with smooth espresso coffee. Pumpkin Spice Latte Chocolate Bar. Allergy info: contains soya, milk & caffeine. May contain nut traces. Suitable for Vegetarians. 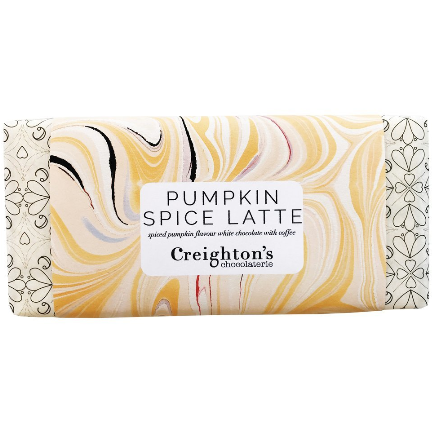 We have lots more great bars in stock from Creighton’s. Take a look at the Black Cherry bar here! We are proud to support a small team of all women who help us create, hand-make and sell our chocolate to you!